The excessive highway travel that your cargo containers will endure can definitely take a toll on them. If you work with cargo containers, you will need replacement parts. Delta Mark offers many shipping container locking pins. 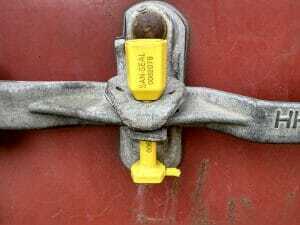 Our replacement iso container twist locks and shipping container pins to ensure that your containers stay securely rigged when being transported. Our inventory of container securing products is sure to have what you are looking for. Have old twist locks? That’s no problem at all. We offer parts for storage container chassis twist locks built in the 70’s and 80’s. We have blueprints for all of our products detailed with their specs. If you’re not sure which flatbed container lock is right for you then one of our experts will certainly be able to help you find exactly what you need. Contact us today.